(Nanowerk News) Scientists from Bochum have managed to accurately determine the location of metal complexes within living cancer cells using Raman microscopy. The researchers have thus gained new insights into the mechanism of action of metal-containing drugs, to which they ascribe great potential capacities, e.g. in the treatment of cancer. These findings are of fundamental significance and are thus featured as a VIP (very important paper) in the current edition of the professional journal Angewandte Chemie ("Label-Free Imaging of Metal-Carbonyl Complexes in Live Cells by Raman Microspectroscopy"). 3D Raman intensity images of a HT29 colon cancer cell incubated with an aqueous solution of the CO-releasing metal-carbonyl complex show that the compound penetrates the cellular membrane and is localized mainly in the nuclear membrane and the nucleolus. The two research teams working under the auspices of Dr. Ulrich Schatzschneider and Prof. Nils Metzler-Nolte synthesized metal compounds that can be effective in the treatment of cancer and infectious diseases. Prof. Metzler-Nolte pointed out that well over 50% of all chemical elements are metals. It is thus all the more surprising that the drug portfolio – with a few exceptions –includes almost bioactive metal complexes despite the fact that these are just as active in cellular models of cancer as the best organic compounds. During traditional research, a drug molecules is synthesized to recognize a known target molecule in the cell, whereas there is almost no data available on the mechanism of action of such metal compounds. The researchers surmise that entirely new mechanisms of action could possibly be precisely due to the special properties of metal compounds. It is thus all the more important that these modes of action be clarified to ensure that new active ingredients with improved properties can be produced. 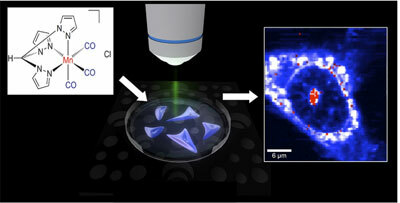 Raman microscopy has now enabled the researchers from Bochum to get closer to this target. The molecules are excited in a microscope by the high-intensity light rays of a laser, which thus enables the recording of the characteristic fingerprint of a molecule located in the focus of the laser. The frequencies measured are just as characteristic of the respective molecule as a fingerprint is. There is also a superposition of many fingerprints due to the large number of substances within a cell, which often makes identification problematic. The scientists made use of the fact that the metal compounds investigated have characteristic vibrations in a frequency range that is not occupied by the other molecules – comparable with individual violin parts in a trombone band. Prof. Martina Havenith and her research group, which has developed new physical methods of spectroscopic investigation, analyzed the fingerprint within the cell. Her colleagues were able to the view the absorption of the metal compound, observing that it is enriched in the nucleus of the cell after a few hours. In contrast to the common methods used, the researchers did not have to destroy the cells for their investigation. They also did not need any further labels such as marker molecules. The localisation of the compound in the nucleus of the cell supplies these synthesis chemists with important information on the mechanism of action and possible improvements in the compound.